The replica of St. Basil Cathedral in Moscow is made of gingerbread and took three months to complete. Moscow, Russia (CNN) -- St. Basil's Cathedral in Moscow, with its colorful onion domes, is an architectural icon. And now you can eat it. Pastry Chef Troman Felizmenio has created a piece of culinary art by making a gingerbread copy of the landmark for the holiday season. He works at the Ritz Carlton hotel near the Kremlin and Red Square. Creation of the edible cathedral, which is 2 meters (6.5 feet) high, began in early September and lasted nearly three months, according to a description from the hotel. Each day, Felizmenio spent two or three hours gathering the pieces together. "When building gingerbread houses of this size, it is important to keep the proportions right. Otherwise the whole structure will collapse, and even the melted sugar, serving as the glue material, will not save it," the chef said in a press release. The gingerbread house is featured as a centerpiece in the hotel lobby. Felizmenio's creation has the same proportions and is an exact exterior replica of the 16th century cathedral. There is one big tower in the center and eight smaller, onion-domed towers around it, all richly decorated with royal icing. Ivan the Terrible, the tsar of Muscovy, commissioned the cathedral's construction to commemorate his 1552 military conquest of the city of Kazan, east of Moscow, which was the stronghold of the Tatars, a Turkic ethnic group. There is a chapel under each dome symbolizing one of Ivan's assaults on Kazan. A ninth tower was constructed in the 1580s to house the tomb of St. Basil the Blessed. 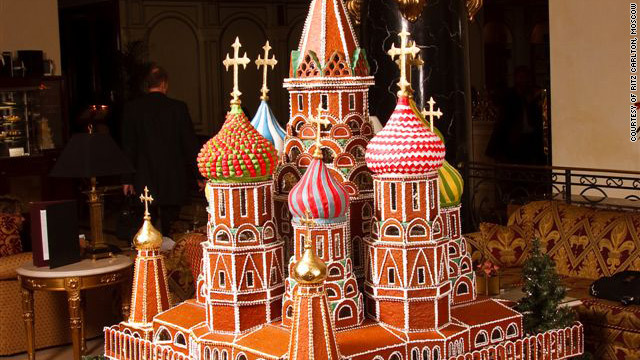 Felizmenio and his team of bakers were making a limited number of smaller cathedrals to sell; prices start at 50,000 rubles ($1,600). CNN's Max Tkachenko and Deb Krajnak contributed to this report.